World time zones available on you PC. Time Zone Clock is FREE for non commercial use, commercial users wishing to buy Time Zone Clock should contact us. 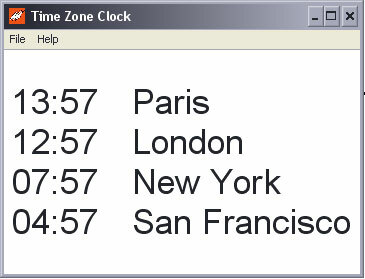 The Time Zone Clock application is a utility for Windows 95, 98, NT ,2000,2003,XP that can be used to show the time in any number of cities around the world. The time from any number of time zones can be displayed simultaneously. The utility automatically adjusts the time for time zone and daylight saving time offsets. 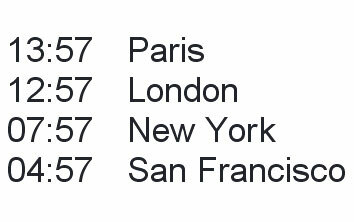 When the Time-Zone-Clock utility first starts it defaults to displaying the time in four cities: London, New York, Frankfurt and Tokyo. Cities can be added and removed from the list by the Preferences screen. 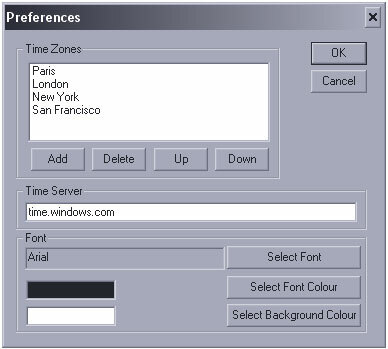 The ‘Add’ window allow any number of time zones to be selected for displaying in the Time Zone List, along with customised text which allows you too customise each time zone with unique text For example “Galleon US Office” or “Jean in Paris” Configure it for the time zone and text you want it to display. The Time Zone List can be made to stay on top of other windows by selecting the ‘Always On Top’ option available from the File menu or right clicking on the application. This allows the City Time Zone List to be visible even if you are working on other documents. 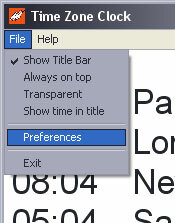 Deselecting ‘Always On Top’ causes the Time Zone List to fall behind other windows as they are selected. The Font, Font size and Font colour can all be changed from the Preferences window. The larger the font the more screen will be required to display the information in the City Time Zone List. The background colour can also be picked from the Preferences window, however you may wish to use "transparency mode", by clicking File/Transparent. Along with Display Mode this can merge Time Zone Clock with your desktop. Download the program now for Free for non-commercial use and if you think it is good please add a link to this page so more people can find this World Time Clock see bellow for sample HTML code for a link back to this page or e-mail us and we will send to an email explaining how to add a link to this page. Hope the Time Zone Clock is what you were looking for.